Finny [Book Review] – my books. my life. Remember how I was looking for a book to take me out of my reading funk a few weeks ago? Well, I found it. This is the book that re-energized my love of reading. We meet Finny Short as an observant, defiant fourteen-year-old who can’t make sense of her family’s unusual habits. Her mother offers guidance appropriate for a forty-year-old socialite; her father quotes Nietzsche over pancakes. Finny figures she’s stuck with this lonely lot until she meets Earl Henckel, a boy who comes from an even stranger place than she does. Unhappy with Finny’s budding romance with Earl, her parents ship her off to Thorndon boarding school. But mischief follows Finny as she befriends New York heiress Judith Turngate, a girl whose charm belies a disquieting reckless streak. Finny’s relationships with Judith and Earl open her up to dizzying possibilities of love and loss, and propel her into a remarkable adventure spanning twenty years and two continents. And every character in the novel, big and small, was extremely well-developed and interesting. This is a story of relationships and the way they shape and change Finny over the years. The characters are the story. And the characters were quirky yet realistic (for the most part). From the warm and welcoming narcoleptic Mr. Henckel to the pair of sneezing morticians to the devoted yet indecisive Earl, I laughed and cried along with them. This book spans a long period of time (about 20 years). The characters changed and grew yet remained the same characters. In general, I think I prefer novels that focus on a shorter period of time so that I can get to know the characters at that point in their lives, but Kramon got this right. The Finny from Chapter 1 is very different from the Finny at the end of the novel, but I maintained that connection to her throughout the book. The novel stays with Finny during the important times and quickly fast-forwards through the less important times in her life, but I actually liked these fast-forwarding chapters as much as the rest of the novel. They manage to sum up long periods of time in a wonderfully emotional way. I’m pretty sure there were tears during both of them. 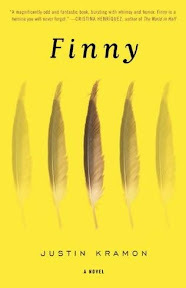 Finny is laugh-out-loud funny woven between beautiful prose and deeply emotional experiences. There is a quotable sentence on every page. Also, how awesome is it that this is a coming-of-age novel about a girl written by a male author? Basically, I loved this novel. I know it’s only July but I will be surprised if this fails to make my Top 10 of 2010 list and I think it can expect a pretty high position on that list. I was fortunate enough to meet Justin Kramon at BEA and I am so glad I did as I may have otherwise missed out on this wonderful book. I highly recommend it and I hope you love it as much as I did. * Note: Quotation is based on the Advance Uncorrected Proof and may differ from the finished novel. I’ve heard such great things about this book!! I need to pick it up one of these days. Every time I see it I think Finny is a boy though, lol.. Love when a book can re-energize of your love for reading! Yes. I was on desperate need of reenergizing. I hope you enjoy Finny when you get to it. “can re-energize OF your love for reading” LOL… yeah, not thinking clearly. That was the sound of me moving this farther up my reading list. Yay! I really hope you like it. thanks for the post! I’ve been looking forward to reading this for some time. Michelle, thank you so much for this review. It’s wonderful to hear that you enjoyed the book, and the things you said mean a huge amount to me. Jenny, if you get a chance to read it, I hope you enjoy it. I really appreciate your interest, and no worries about not thinking clearly — that’s one of my specialties. Jen, so happy to hear the shuffling sound. Thank you so much. Amy, really glad to hear from you, too. Look forward to hearing what you all think of the book. Glad it got you out of your reading slump! I really want to read this book, and partly because of the female-written-by-a-male aspect. It’s good to hear it got you out of a slump, that’s a good recommendation! My copy came – I’m excited to read it. I think I might save it to bring to Ireland for travel reading. Did I meet Justin Kramon too? I feel like we did most of the same stuff, but I can’t remember meeting him! I hope you enjoy it. I have a really good feeling that you are gong to love it. Pingback: TSS – Books: July [Recap] - my books. my life. I loved the book, also! Your review is spot on! I enjoyed the “Interlude” chapters. A lot. And I didn’t feel like I missed anything after. Jealous you got to meet Kramon. If only I’d read this back in the day and met him when he was around town. Gr. P.S. It’s the second book in a row that made me remember why I love to read. I’ve read a lot lately, not reviewed all of it, but it’s too far between books that I feel better for having read, or excited to sit down and read something. Alright, off I go! Now I must know what the other book is. Please share. Pingback: More Finny - my books. my life.